Liu Jo introduces a sophisticated eyewear design that reinterprets the iconic “Butterfly” motif to create a distinctive and sinuous design. 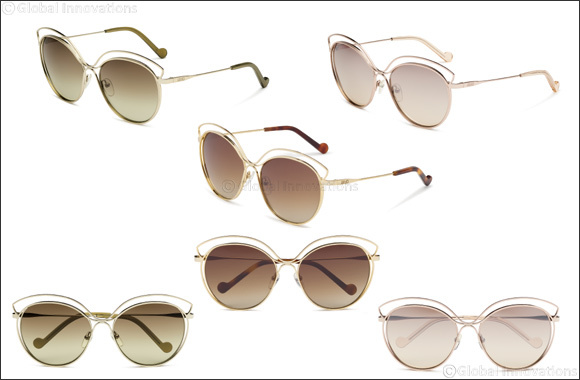 Dubai, UAE, June 7, 2018: The gleaming and glamorous butterfly detail is articulated in the cutout rims that flutter like wings off the front frame, and are further enhanced by the refined combination of the full metal frame and the gradient lenses. At once versatile and intensely fascinating, the new cat-eye style is detailed with the laser engraved “Liu Jo” logo on the slim temples, finished with acetate temple tips for increased comfort. Available in Shiny Gold, Rose Gold and Golden Beauty. Lio Jo eyewear is produced under license by Marchon Eyewear, Inc., one of the world's largest manufacturers and distributors of quality eyewear and sunwear.